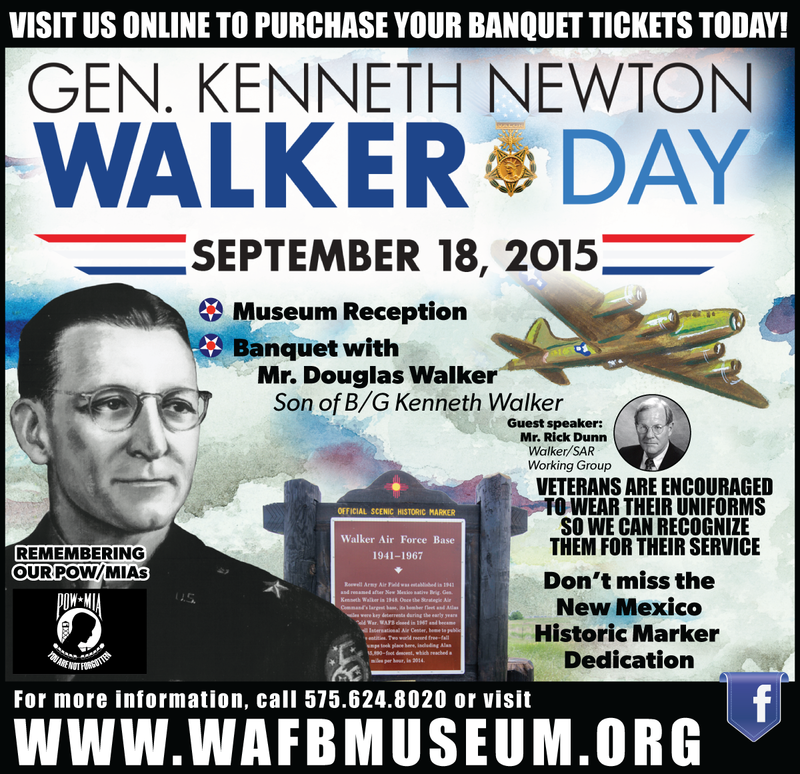 Roswell – Walker Air Force Base, once the nation’s largest Strategic Air Command base, will be commemorated with a roadside historic marker, the Walker Aviation Museum Foundation (WAMF), New Mexico Department of Transportation (NMDOT) District Two and the New Mexico Historic Preservation Division (HPD), Department of Cultural Affairs announced today. The Official Scenic Historic Marker will be dedicated at 2 p.m., September 18, at the intersection of U.S. 285 and Roswell Relief Route South. Representatives of the community, WAMF, NMDOT District Two, HPD and the Cultural Properties Review Committee will attend the dedication and ribbon cutting. The base was first established in 1941 as Roswell Army Air Field and renamed for Brig. Gen. Kenneth Walker, who was the highest ranking U.S. Army official reported missing in action during World War II. The plane he was flying in the Pacific Theater was shot down in a bombing mission over Papua, New Guinea, on January 5, 1943. His body was never found. 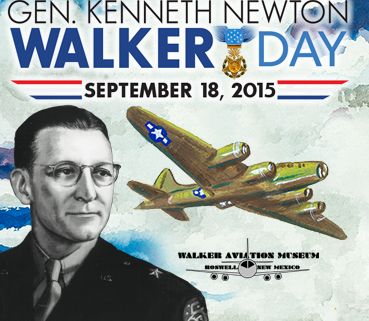 Walker was awarded the Medal of Honor posthumously by President Franklin D. Roosevelt the same year. When the U.S. Air Force began establishing Strategic Air Command bases in selected parts of the country during the Cold War, the Roswell field was selected and renamed to honor Walker who was born in Los Cerrillos, New Mexico. His distinguished military career began in 1917 when he joined the Army to fight in World War I. Historic markers provide history vignettes of New Mexico’s significant landscapes, accomplishments, persons and events. The program originated in 1935 to highlight the state’s heritage and attract the growing number of motorists touring the Southwest to visit communities and explore their heritage. Today there are more than 500 historic markers along New Mexico roads. The program is a partnership among the public, HPD, NMDOT and the Cultural Properties Review Committee. NMDOT District Two, based in Roswell, is responsible for maintaining approximately 60 historic markers in southeastern New Mexico. With HPD, the department works with the public to facilitate nominations and handle reports of damaged markers. The NMDOT is responsible for the cost, location, installation and maintenance. HPD and the CPRC are charged with researching and writing texts and determining subjects appropriate for the markers. Manon Arnett, Public Information Officer for the New Mexico Department of Transportation District Two at (575) 637-7210 (office) or manon.arnett@state.nm.us. Tom Drake, New Mexico Historic Preservation Division Public Relations and Historic Marker Coordinator, 505-827-8320; tom.drake@state.nm.us.